We already made a sneak peek blog post of Desi and Cassia but here is some additional information on them. Desi and Cassie are the BreyerFest 2017 Open Show Overall Grand and Reserve Champion prizes. The glossy prize models have not yet been announce for the open show and I have not heard any news on the prize models for the Children and Youth Shows. Does anyone have any information on these? We’re excited to introduce all of you to Desi! 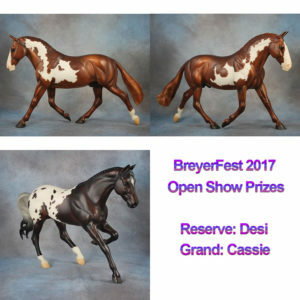 Desi is the BreyerFest Gateway to India Open Show Reserve Prize. 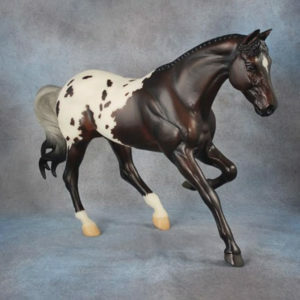 This handsome fellow is a dark bay blanket appaloosa on the Gem Twist model (mold 495) which was sculpted by Kathleen Moody. He has detailed tri-colored eyes and a chalky white base coat. Desi is just an Indian slang term for a local in a community and think Desi will make the perfect ‘local’ in any collectors herd. Best of luck to all of our showers! I’m head over heels for Cassia. 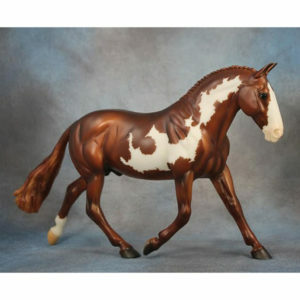 I have grand dreams of winning a Cassia in the BreyerFest 2017 Open Show but we all know that the likelihood of this happening is slim to none =D He is the Breyer Cleveland Bay mold that was sculpted by Karen Gerhadt. Karen Gerhadt also sculpted the Premier Club Shannondell model who will be released at BreyerFest 2017 as Vahana, a Tent Special Run. Cassia is a really great mold in an even better color! He is the braided version and is a vibrant coppery chestnut frame overo with detailed eyes. Cassia’s name is derived from the name of the component used to make cinnamon. This handsome fellow is on the fan favorite braided Cleveland Bay mold which was sculpted by Karen Gerhardt and is mold #703. Cassia is a rich coppery chestnut frame overo with detailed tri-colored eyes. This suave and spicy guy is the BreyerFest Gateway to India Open Show Grand Prize. Cassia gets his name from the substance that cinnamon is made from in case you were curious. Lucky winners we say! « Last Day To Enter For Acadia!